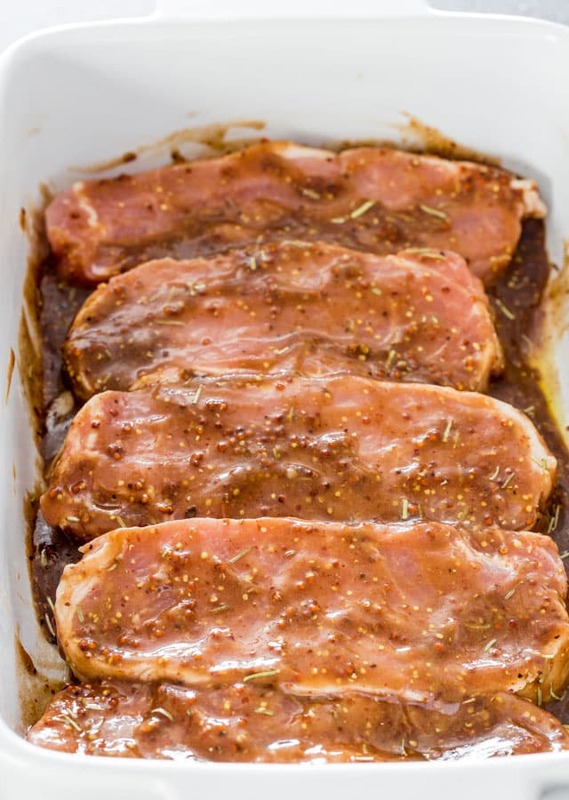 Mustard Balsamic Pork Chops with Rosemary – 5 minute prep time! 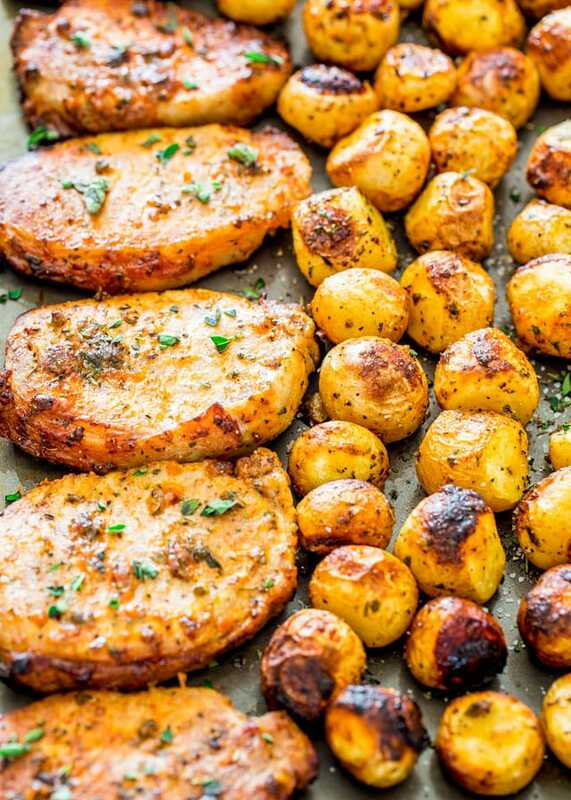 These pork chops couldn’t get any easier, they’re so delicious and tender, they simply melt in your mouth! I was having a bit of writer’s block and couldn’t quite think straight of what to write for this recipe’s heading, so I went and fried some bacon to get my creative juices flowing. Works like a charm. Fried a whole package of thick sliced bacon, drove hubs and the crew crazy. Nevermind the dog! Bacon does the mind good, although I didn’t eat any myself, just the act of frying bacon works for me. Must be the smell, can you guys think of a better smell than bacon? They should put it in a bottle and sell it, maybe they do already, what do I know. 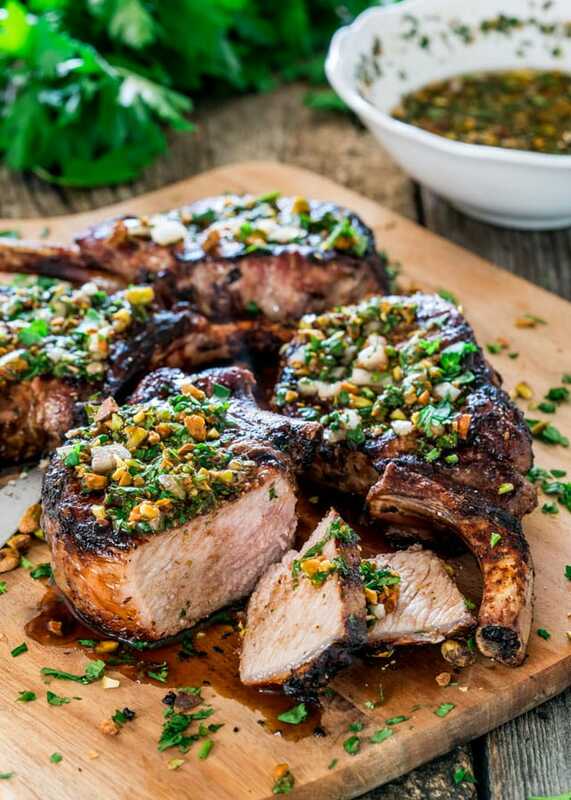 I know summer is almost here and it’s grilling season, but I baked these pork chops because my grill is still not hooked up and the weather has been very finicky, rain, sunshine, rain, sunshine, repeat. All in the same day! It’s like the weather can’t make up its mind, it changes like the weather! HA! Feel free to grill these pork chops if you want, I don’t think it matters. The flavor will be there regardless of how you cook them. But we sure did enjoy them baked, they got so tender they melt in your mouth, you almost don’t even need a knife to cut into them. 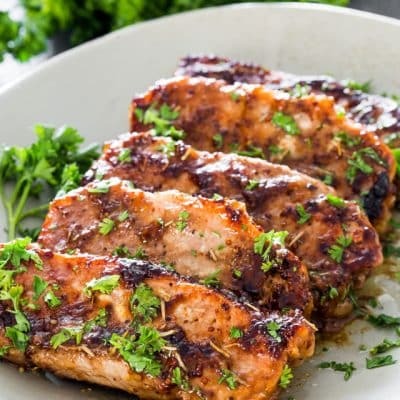 I have to say I didn’t use to add mustard to my marinades but ever since I made this recipe I can’t get enough of marinades like this. See you can teach an old dog new tricks! The trick here is to be patient and let the pork chops marinate for a bit, at least an hour, but it would be best if you let them longer. Ideal situation would be to prepare this the night before and just bake them right when you come home from work, you’ll have one easy supper. They go great with a salad, served mine with a classic Greek salad, but they’d be great with some mashed potatoes, or roasted potatoes as well. 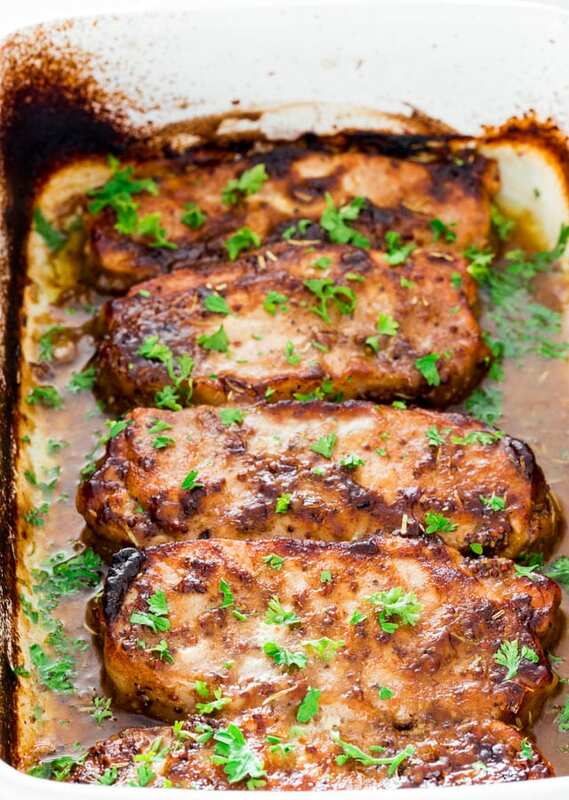 Mustard Balsamic Pork Chops with Rosemary - 5 minute prep time! 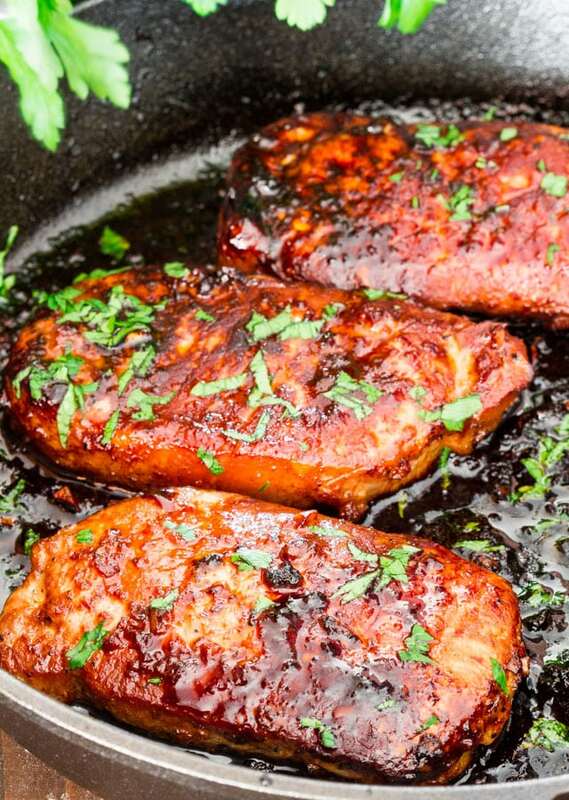 These pork chops couldn't get any easier, they're so delicious and tender, they simply melt in your mouth! Add all the ingredients (minus pork chops) to a bowl and whisk until the mixture begins to emulsify. 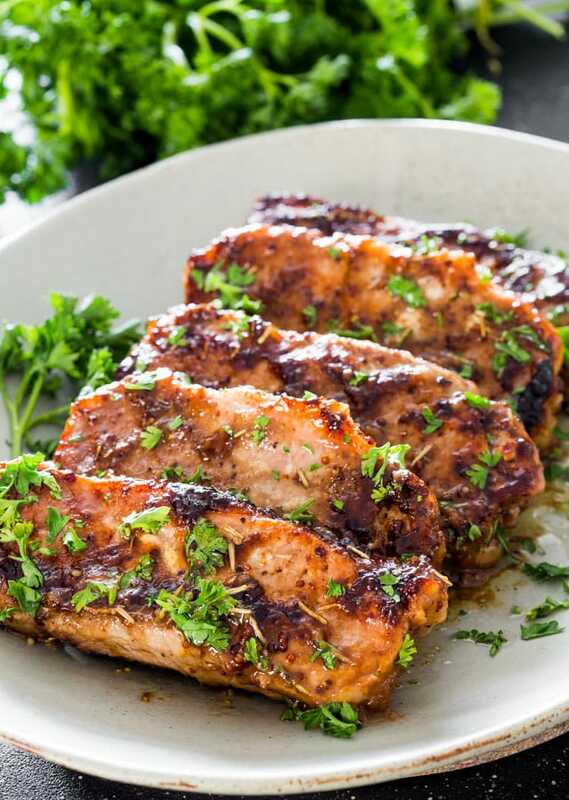 Add the pork chops to the same casserole dish you'll use to bake them and pour the marinade over the pork chops. Make sure you rub all it all over them. Cover with plastic wrap and refrigerate for at least 1 hour to overnight. You could prepare these the night before and bake them when you come home from work. Remove plastic wrap from casserole dish and bake them for about 20 to 30 minutes or until done. All ovens are different, so you should start checking on your pork chops after 20 or 30 minutes to make sure they don't get over done. I have made this a few times. I really like this and I am not the biggest fan of pork chops. That’s great, glad you like them! Great flavor! i doubled the recipe so we had enough for my family of 5 and leftovers for lunch! only problem is that the cook time is way off! i read some of the other reviews and checked it at 20 minutes and they were overcooked. Next time i’ll take them out at 15minutes and let them rest up! Thanks for the grade flavor combo though!